This Croatian Mussels recipe is known as dagnje na buzaru or školjke na buzaru. "Buzara" in Croatian literally means "stew," but buzara-style cooking simply means that some type of shellfish or crustacean is cooked with olive oil, wine, garlic, breadcrumbs, and fresh herbs. At the most, this easy recipe will take 40 minutes to prepare from start to finish. Mussels na buzaru is similar to classic French steamed mussels known as moules marinières in French. 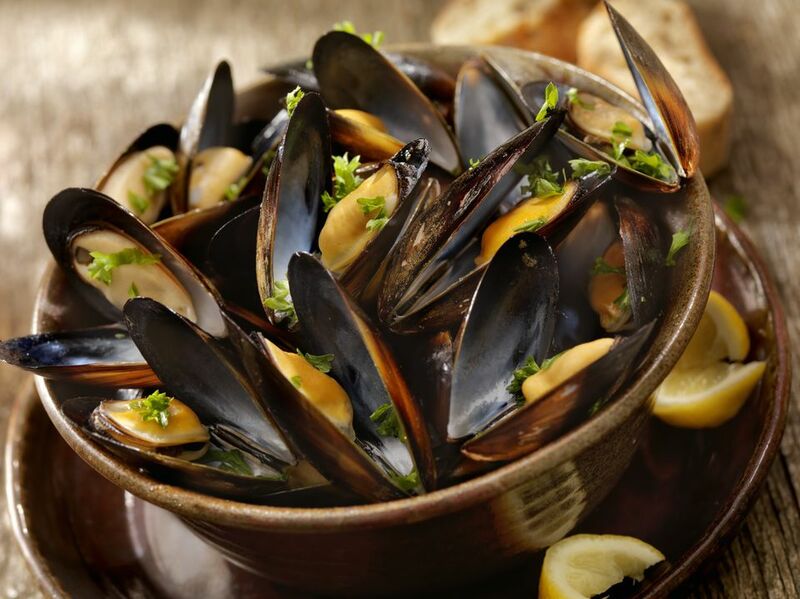 While mussels are seasonal (the old rule was to eat mussels in cool months and only in those months that have an "R" in their spelling), current wisdom dictates that "farmed" mussels are safe to eat year-round. Fish, shellfish, crustacean, and bivalve recipes are popular along the Dalmatian Coast where there are a strong Italian influence and diverse seafood offerings from the Adriatic Sea. Scrub and debeard 4 pounds mussels. The "beard" is the hairy thing hanging from one side of the shell. Pull it off with a side-to-side motion. In a large, hot skillet, add debearded mussels, 3/4 cup olive oil, 1/4 cup chopped fresh parsley, and 8 cloves (more or less to taste) chopped garlic. Let this simmer undisturbed until mussels just begin to open. Stir, lower heat, and add 1 1/4 cups dry white wine, coarse sea salt, and black pepper to taste. Be careful not to over-salt because mussels from the sea are naturally salty. Let all the shells open, stirring occasionally. If, by the end of cooking, any shells do not open, discard them. Turn the heat back to high to finish the cooking quickly without toughening the mussel meat. Mix 1/2 to 3/4 cup fresh breadcrumbs into the broth, but you'll want to leave some liquid present. Serve with crusty bread to soak up the broth.